Combine sugar, syrup and nuts in 1-quart glass bowl. Microwave uncovered on high for two minutes. Stir. Cook on high six minutes. Add butter and vanilla. Cook 1 - 2 minutes. Add soda, stir and pour onto buttered tray. Spread immediately with spoon. Cool completely and crack. Microwave semi-sweet and white chocolate in separate bowls until blended and melted. Stir and check often. This is important or it will burn. Stir half of nuts or coconut into each bowl and drop by spoonfuls onto waxed paper (or parchment paper) on baking sheet. Swirl them together with table knife. Put in fridge an hour or so and then break into pieces. I used toasted pecans. Peppermint bark is a Christmas classic. Who can resist dark chocolate, white chocolate, and crisp bites of minty candy canes? This delicious, easy peppermint bark makes a wonderful holiday gift. If you don't have the time or inclination to temper the chocolate, you can either use candy coating, or use untempered chocolate. If you use chocolate chips, don't try to temper them, simply melt them. Just be aware that untempered chocolate bark will melt easily, so it should always be stored in the refrigerator. Unwrap the candy canes and place them in a food processor. Pulse on/off several times for 5-10 seconds each, until the canes have been crushed into small pieces. Alternately, place the candy canes in a large Ziploc bag and seal tightly. Use a rolling pin to roll/smash the candy canes until they are the size you desire. Prepare a cookie sheet by covering it with smooth aluminum foil. Melt or temper the dark chocolate. Pour the chocolate onto the prepared cookie sheet and use an offset spatula or knife to spread it to an even thickness, a little more than 1/8" thick. The chocolate does not have to reach all sides of the sheet, as it will be broken up later anyhow. Place the tray in the refrigerator to firm up while you prepare the white chocolate. While the dark chocolate hardens, melt or temper the white chocolate. Stir in most of the candy cane bits, reserving about a quarter of the mixture to put on top. Remove the tray from the refrigerator and spread the white chocolate in an even layer over the dark chocolate. While the white chocolate is still wet, sprinkle the remaining candy cane pieces over the entire surface evenly. Press down very slightly to ensure they stick. Place the tray back in the refrigerator to firm up for 30 minutes. Once the peppermint bark is completely set, break into small, uneven pieces by hand. Stem the kale and tear into 3 inch pieces. Put in bowl and sprinkle with olive oil. Massage until all leaves are covered with oil. Sprinkle with a small amount of salt. The salt will be concentrated when done, so use a small amount. Sprinkle with a little garlic powder and hot spice like Chipotle or cayenne. Bake at 350°F for 12 minutes. If using a lot, use more than one tray. (My tray was very full and it took about 18 minutes.) You can keep it in the oven with the door open and oven off for a while. It’s best before it gets brown. It will be very crispy and paper thin and it’s a good snack to sneak into children's diets. Don’t use too much spice for them. Mix well and chill until firm. Roll small amount of cream cheese mixture to fit the size of the date half. Put it in the date and put a pecan half on top. Chill until ready to serve. The flavors are more pronounced the longer it chills. Start with lining a large cookie sheet with foil and set aside. Mix the 5 dry ingredients in a small bowl, mix light and dark brown sugar in a small bowl. 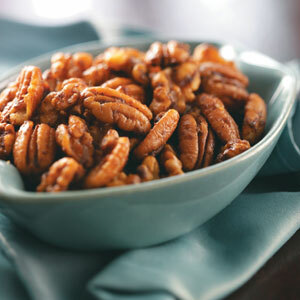 Put pecans in a 10 inch skillet on medium heat and toast for 4 to 5 minutes, until they are a little toasty. Add the butter and stir until it is melted and nuts are coated, then add the 5 dry ingredients and stir to coat. Add 2 tablespoons water and brown sugars and stir to coat. Fold out onto lined cookie sheet and let cool. ENJOY! !